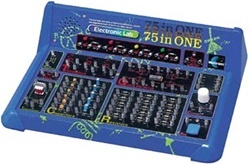 This is the 75-in-1 Electronic Project Lab from Elenco??. read schematics, and wiring diagrams. voltage detector, optical volume, and so much more!